Huge Savings Item! 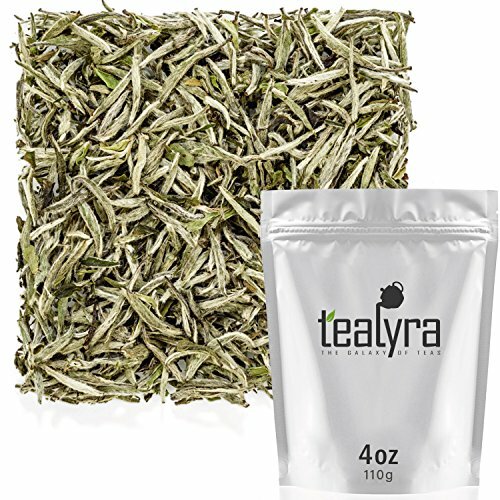 Save 13% on the Tealyra - Premium White Silver Needle Tea - Bai Hao Yinzhen - Organically Grown in Fujian China - Superior Chinese Silver Tip White Tea - Loose Leaf Tea - Caffeine Level Low - 110g (4-ounce) by Tealyra at Jakis Cafe. MPN: COMINHKG039109. Hurry! Limited time offer. Offer valid only while supplies last. Although this is one of the higher priced white teas available, it is also classed in the top ten when it comes to superior Chinese tea. Although this is one of the higher priced white teas available, it is also classed in the top ten when it comes to superior Chinese tea. Traditionally produced in the northern district of the Fujian province of China, this tea has been popular in its home country for thousands of years. Plucked from the fresh April harvest, our Bai Hao Yin Zhen Silver Needle is a delicious premium white tea. It can only be harvested on a few days of the year when conditions are optimum, which is why it is classed as one of the top ten premier Chinese teas. Bai Hao Yin Zhen Silver Needle is renowned for its wide range of health benefits, and is rich in anti-oxidants, which can help to neutralise the effects of harmful free radicals. It has a naturally sweet taste, which is perfectly balanced by a slightly smoky, woodsy fragrance that belies its light but complex palate. Just delicious! Bai Hao Yin Zhen Silver Needle is renowned for its wide range of health benefits, and is rich in anti-oxidants, which can help to neutralise the effects of harmful free radicals.